Bollywood superstar, Madhuri Dixit is making her comeback after six long years with Yash raj's film "Aaja nach le" and will be seen sizzling on the Tv show Koffee with karan this sunday. This will be the first time that she will appear on this show. The show will be telecast on Star one and Star World. 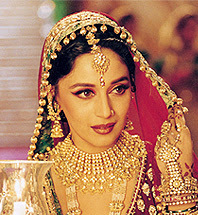 Yes, we are all waiting to see this beauty yet again on the silver screen. Because, that's what she is, beautiful! She seems to have lost a lot of weight and is looking absolutely slim and fit, and stunning, as usual. She always had that certain charm and enigma that attracted the audience to her and to add to that she is also a fantastic and graceful dancer. No other actress, after her, has been able to replace her. I guess, she will always have that special place in the industry. No doubt then that she is the most beautiful woman ever... she has the most magnificent smile ever... and is truly the most fantastic actress ever... they don't make them like her anymore...! 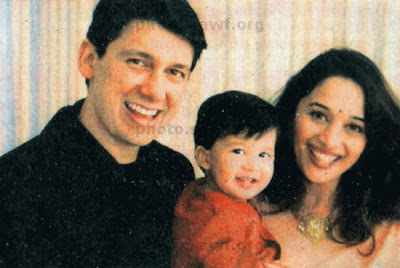 On the show, Madhuri talks about her comeback in Bollywood after a long hiatus, what all has changed since then, her family, and life in the United States, among other things, a press release here said. She also shares how she met her husband Ram, the fact that they complement each other very well and that he has always been very supportive of her decisions! That's not all, on this week's exciting episode, watch out as one of Bollwood's finest and talented actress who is a die-hard Madhuri fan makes a surprise visit! Who is she? Well... you will just have to wait and watch! This show is one that I would definitely not like to miss!